During the last few years, billions of dollars of low-cost foreign capital has been invested in U.S. businesses via the EB-5 program. While the program was established in 1990, it has only recently received widespread acceptance as a viable project funding solution. In fact, between 2005 and 2013, over $6.5 billion dollars was invested in U.S. businesses from this program. It is now considered a viable capital source for projects of a variety of sizes and types. However, many businesses and project developers have wasted hundreds of thousands of dollars and years of time believing that they could easily get their project funded with this low cost capital. It is, in fact, not so easy. To better understand the challenges of securing low cost EB-5 capital, developers must consider what EB-5 investors need and what they want. These considerations are key to understanding if your project will fulfill investor demands and whether you can successfully raise EB-5 capital for your project. What do investors need? Their investment is primarily motivated by a desire to move to and settle in the United States. They can move to the United States if they invest into a qualifying business and get approved for their green card via an I-526 petition. They can stay in the United States only if their investment creates 10 permanent, full time jobs for U.S. residents, generally within two years of the funds being invested (per investor subscribed). Because of these requirements, the investor and his/her entire family is relying on the EB-5 project or business to create at least 10 qualifying jobs. That is what they need. What do investors want? They want their money back in a reasonable time (around five years) and usually with some return on their investment. Currently, that return on investment is around 1 percent per year, making EB-5 capital a very attractive funding option for investors. However, a developer will often recruit investor representatives, or agents, who will charge the developer between 2 and 5 percent (sometimes higher) per year on the funds raised to help place investors. Therefore, EB-5 capital, often structured as equity in the capital stack, is closer to bank debt rates. Still, it is a lot less expensive that traditional equity capital. While there is no requirement in the regulations to repay investors—in fact, investments must be made with the understanding that the capital is at risk—it is common practice to repay investors at least their principal amount, and investors will be looking for such an exit strategy when shopping for an EB-5 project. EB-5 investors are becoming increasingly more sophisticated in their project risk assessment capability and due diligence activities. For a number of years, many projects that were inappropriate for EB-5 because of venture-capital-like investment risks were promoted and sold to unsophisticated investors. Additionally, some fraudulently structured projects were sold to investors and indictments have been issued as a result. Now, various U.S. governmental agencies (the SEC, FBI and others) are paying closer attention to EB-5 offering documents and the claims that they put forth. Additionally, EB-5 investors are becoming much more sophisticated in assessing how their “needs” and “wants” will be satisfied. At the same time, however, there is significant and growing investor interest in the EB-5 program and investors are clamoring for safe investment opportunities. One Chinese official, speaking in September of this year to U.S. EB-5 project sponsors at an EB-5 conference in Xiamen, China said that the Chinese EB-5 market is at least a $50 billion dollar business. Further, they have already licensed 800 agents to sell EB-5 programs and have many times that number of agents seeking a license. The Chinese officials were also quick to point out (and quite emphatically) that the U.S. project developers must better understand the needs of the EB-5 investors and only provide safe and appropriate EB-5 projects. The appropriate EB-5 project will have a credible certainty of creating at least 10 jobs per investor within the regulated time frame. Further, it will also be able to demonstrate a very high certainty of returning the invested funds—usually within five years—without offering any guarantees. Therefore, EB-5 funds are not appropriate for speculative projects, nor for venture capital projects, nor for unproven business models. Only projects with a proven business model, with a proven management team and with very high cash flow predictability ratios are appropriate for the EB-5 investors. Why? Because the ability of an investor’s family to stay in the United States is entirely reliant on the jobs being created, and being created on time. Job creation. EB-5 investors (and the astute agents promoting EB-5 projects) are becoming increasingly aware of ways to evaluate business models and determine the job creation predictability. However, job creation methodologies must be evaluated for each project, on a case-by-case basis, as they may contain a mix of direct, indirect or induced jobs, as well as operational and construction jobs. Rather than looking at specific projects and/or types, let’s review things that professional financiers look at. Track record. After assessing the: 1) local market demand for a business project, via a market study, and 2) the national trend for the industry, investors look at the competence and experience of the management team. Often, the greatest predictor of future success in a business is a history of past successes (and being able to replicate that). For example, if someone starts their first new business, the probability of failure is very high, statistically speaking. However, if someone has spent 10 or more years creating seven identical and successful businesses, the probability is high that the eighth business will be a success as well. This is exactly why franchises thrive in the United States: because many of the “start-up” challenges are well planned out and failure avoidance processes are taught to the new franchisee. Location and feasibility. The astute project financiers know that an experienced and successful developer will likely select a location for the project with a strong local market demand. This will be verified with a third party market feasibility study. Further, the financier will also expect that the experienced developer will be able to show a growing demand for the product or service over a long and sustained period of time. Expecting the unexpected. What the financier is really counting on is that the experienced developer will also be able to resolve unpredictable project problems that occur, and then survive them. Unexpected and unplanned project problems do happen. I can recall a construction delay because turtle shells that were discovered while excavating a project site. That caused a six-month archeological dig and assessment on the site. The developer was able to survive that delay because they were very experienced and had a strong balance sheet. What financiers and investors are relying upon is that an experienced developer has seen it all and can usually resolve even very difficult problems that would otherwise cause a less experienced, and possibly thinly capitalized, development team to fail. Planning ahead. The project financier (as well as the EB-5 investor) is also assessing the long-term industry demand for the project. Almost all EB-5 investments are put into real estate-based operating businesses. As a result, when the EB-5 investor gets repaid in around five years, there will have to be a lender who will want to put a 20 to 30 year loan on the business or facility. As a result, the industry projections have to be very strong for many decades ahead. Many financiers have seen how online technologies impacted some brick and mortar retail operations, such as with Blockbuster Video and Barnes & Noble. Astute financiers and EB-5 investors will study the long-term industry trends as well as the short-term local market demand to assess the safety or predictability of success of a project. One of the most difficult problems for most any real estate-based business or project to deal with is the issue of unpredictable economic cycles. Revenues and profitability can be good for all project types and industries during economic expansion, whether or not the projects would have otherwise been successful. As the saying goes, a rising tide lifts all boats. 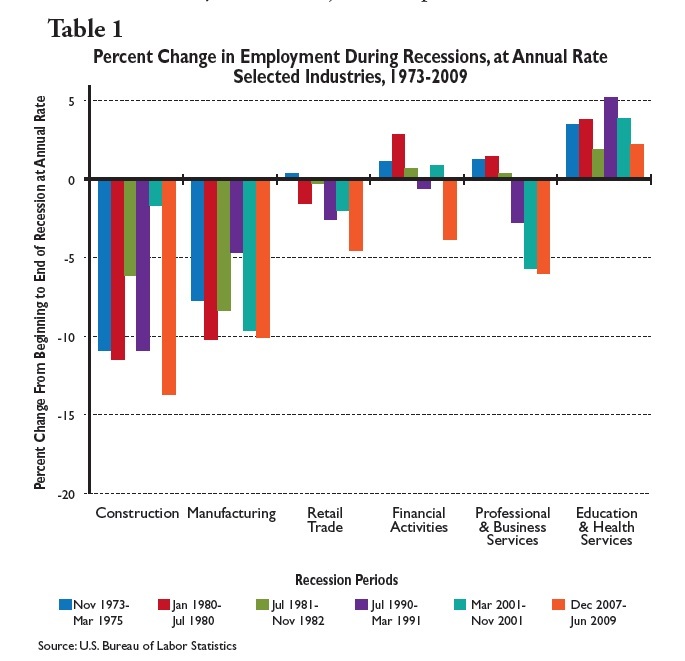 Many industries (and the businesses therein) suffered greatly during the last U.S. economic recession. Why is this important to the EB-5 investor? Because if the investor invests in an EB-5 project in an industry that is highly likely to be impacted by a recession (see Table 1), then the project may not have all the jobs exactly when they are needed. If that happens, the EB-5 investor and family can be subject to deportation. Let’s look at this issue in more detail. After an investor prepares and submits their I-526 petition, USCIS adjudication can take over a year. Add several more years for the time to prove job creation and now the job creation counting is taking place three to four years after the I-526 submission. If a recession occurs during the time the jobs need to be counted, revenues can be way off, layoffs can occur and the needed EB-5 jobs may not materialize (see Table 2). 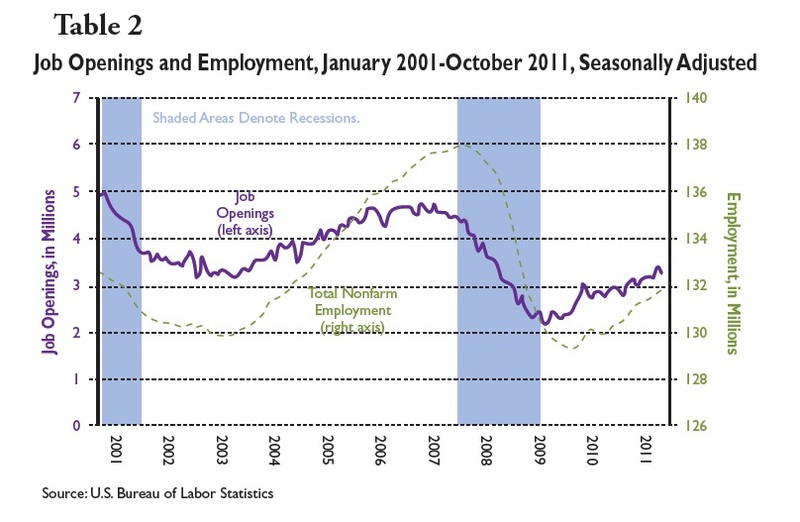 Regardless of the type of economic study model used for the job creation projections a recession can, and usually does, negatively impact job creation or job retention. The difference in job impact is tied to the project’s industry. Depending on the industry, developers should have safeguards in place to ensure that all of the EB-5 investors that invest in a project are thoroughly protected, in case a severe recession hits again. In summary, EB-5 project developers need to create and sponsor projects that are very safe—more akin to putting funds in a bank than venture capital funding; secure, in terms of job creation; and predictable, in terms of returning investor funds in a reasonable timeframe. Despite challenges, EB-5 capital remains a very attractive funding option for projects. Investors, however, are looking for credible projections of project success, and high project supply means that they are able to get their demands met. Before embarking on a capital raise, it is important to understand what goes into a successful and marketable EB-5 project. Association to Invest in USA (IIUSA), n.d. Web. 17 Nov. 2014. Gregory Wing is the managing partner and co-founder of Education Fund of America, a company that funds public charter schools with EB-5 capital. To date, his company has financed the development of 13 charter schools with over 30 more planned during 2015. Greg is also founder and president of Bedford International. The Bedford companies have closed over $5.5 billion in commercial real estate loans and investments.